We saw this coming. It’s like when you start sniffing and coughing and you know the real flu is coming. And you know you cannot do anything about it, because even if you take a very strong aspirin, it is too late and you will get sick for at least a couple of days. We saw this coming: the truth is that the consequences of Typhoon Yolanda are not only the one that we see on TV every day, but they are virtual, and the worst of those virtual consequences is coming. The Digital Humanitarians (or the Volunteer Technical Communities, as you want to call them) came to be out of an amazing change in the world we live: the internet and mobile phones, with which now you can help, and talk, and share with anyone in the world. And you don’t need to have money or to be a professional to provide support to affected communities. You can give your contribution and you help just by sitting behind your desk in your comfy sofa. But is that true? Does “the crowd” knows what to use and how to use it in a humanitarian crisis, and does it know what are the consequences of its actions? The answer is that no, most of the people in the crowd do not know what they are doing. But they are doing it anyway. People want to help, and they can help, but they are not necessarily professionals, they have not done this before. Most of the times they do not know what the “do not harm” principle is and means in a practical way, and most importantly, they do not see the consequences of what they do. This is not a new thing though: we have seen this in Haiti, in Pakistan, in Chile, Libya and we are starting to see this in the Philippines. And because Internet has not been restored entirely in the country yet, the magnitude of what it is gonna happen in the Philippines is still unknown. You don’t trust me? Want some examples? This messages was posted in Facebook (I added the black lines to cover the information) and then reposted by several people – I counted 64, but only the re-posts from one account. Which means that I don’t know how many others have reposted it from their accounts. To some of you this may look like heartbreaking (and it is in fact) and you may think that it is very nice for people to share this story so that maybe someone will help this family. The problem that I have with this is that whoever re-posted this did not knew that he was basically saying to whoever has bad intention: “Hey, here there is a young woman with two little kids, and two wounded people with her. Here is her location, and she is scared and alone, with no means to get for help”. This is more or less like to tweet that you have a million dollars in your house and that you are gonna go out for a drink and leave the door open. This post, also on Facebook, has already 4000 shares and 5000 likes. The black boxes to cover the children faces were added by myself – here. The post has also 820 comments, a lot of those asking the organization that posted this to delete it, denying what they claim (that they will take all the children under 18 in the Philippines to the US for adoption). But there are also a LOT of comments asking how people can apply to adopt those children – some people even choosing which one they want from the picture. If any of the readers of this post have been to Haiti, they have seen this kind of things before. 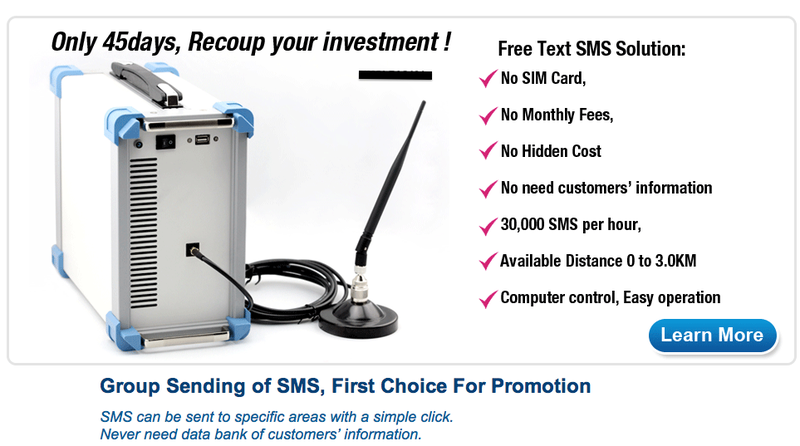 Now, this company is not doing anything illegal, and they are just offering a very good service to send blast SMS to multiple people in little time – a very good and interesting solution. The problem is, is that a coincidence that I received this just when the Typhoon happened? and that other 10 different companies sent me an email with very similar products or offers? On Twitter and on several online volunteers Skype chats, I have also seen people already talking about how to set up SMS system to send messages to the people in the Philippines, how to set up a Text2Tweet account, how to harvest requests for help and geo-locate them on line, etc. Now, don’t get me wrong: information sharing, and the use of technology to provide people with the information they need, when they need it, it is absolutely fundamental! This is why I work for an organization like Internews. Because information is KEY and can save lives. But it can also destroy lives if it is not treated properly and handled with cautions. 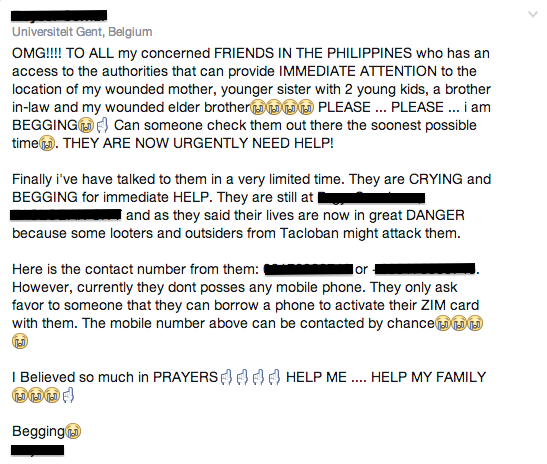 In Haiti we saw a proliferation of SMS services, requests for help spread on the internet with sensitive data in it, and multiple people organizing their own “shipment” of goods to the country – not knowing if anyone really needed that. A lot of the people behind those projects REALLY MENT WELL and learned their lessons the hard way. Humanitarian Organizations and NGOs were not immune to this “multiplication” of digital information systems. The real victims though, Haitians people, were the once left to deal with it: misinformation, frustration, and sometimes much more serious consequences. Let’s be clear here: I am not writing this post to ‘demonize” online VTC or DH communities and individuals. This is not the case. I am myself the co-founder of an organization that does that, the Standby Task Force. This is in of the reason why 3 years ago with some colleagues we created this organizations: to be ready, but most of all to educate people, and to be able to support humanitarian organizations during a crisis, while making sure we can help people not to harm others. This is why we have codes of conduct and CDAC trainings for our volunteers. But the truth is that the beauty of the internet, in humanitarian crisis, is also its curse: everyone can do everything and does not need to be “trained” or to be a “professional”, or to be part of a formal organization. B. Contact the relative NGO working on the ground in the Philippines – use this resource here to find out who does what. C. If you think that the message is really urgent, and that someone CAN do something about it, look for a hot line number – the government in the Philippines is setting those up for the municipalities locally. See here. 2. If you want to help in any way, contact an NGO, or a humanitarian organization and ask them. If you don’t find anyone, email me(I am at anahiayala@gmail.com or @anahi_ayala). I swear, I will make time to answer to you. DO NOT DO ANYTHING ON YOUR OWN INITIATIVE IF YOU HAVE NEVER DONE THIS BEFORE. You can also join one of the many online communities that have been doing this for some time, see here a list. 3. Do not try to send information to the local communities online unless you are SURE that the information you are giving is correct. If you see a request for help, use the internet wisely: search for a governmental agency, local or international NGOs, UN agencies that are working in that area, see if they have a contact information. 4. Use this resource to find out what is being done and how. 5. Think before you do. I know, we are emotionally touched by what happened and is happening, but the fact that you are online does not means that the people in the Philippines are virtual. Everything you say or do has consequences in their real life. 6. Do not create new software, technologies an other techie stuff to help the humanitarian community without talking to them first. Here is why and how you can do that. 7. If you hear something that sound crazy, probably it is crazy. Do not report/share or re-tweet it automatically, but try to figure out from other sources. Do your homework! 8. And for the love of god, DO NOT SET UP YOUR FREAKING SMS SYSTEM!!!!!! Unless you are the PH Government, or a coordinated effort from all the RESPONDENTS on the ground. Really, just don’t do it. The Internet is a powerful tool, use it wisely and think twice. You are not in an emergency, so you can take the time to do that. Keep willing to help, contributing to the community and make your a contribution to a better world, just make sure you don’t screw up. This entry was posted in Crisis Mapping, Crowdsourcing, Humanitarian Affairs by Anahi Ayala Iacucci. Bookmark the permalink. Masterful discussion of when the crowd forgets Mary Anderson–and what to do about it. Elegant post on the dark side. I re-posted it in my class blog. The combination of being careless with personal information, scams, and the proliferation of SMS make it difficult to see clearly what is happening on the ground and to be able to respond in a timely fashion.